New parks, pathways, charter school, business improvement district and more. 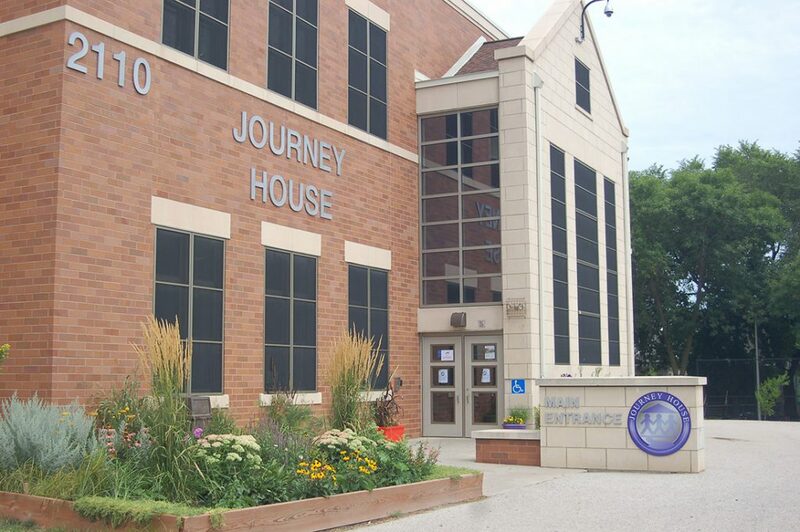 Journey House opened its new community center at 2110 W. Scott St. in June 2012. The new building is attached to the south side of Longfellow School. Photo by Jenny Whidden/NNS. 1) Journey House Longfellow Center for Family Learning and Youth Athletics: The multipurpose building added onto the Longfellow School allowed Journey House to consolidate its three locations. It opened with a new cafeteria, kitchen, gym, computer labs, classrooms and administrative offices in 2012 after more than a decade of visioning, strategic planning, fundraising and construction. 2) NFL Football Field in Mitchell Park: An official NFL practice field was donated by the Green Bay Packers in 2009 and installed in June 2013 on the east side of Mitchell Park. 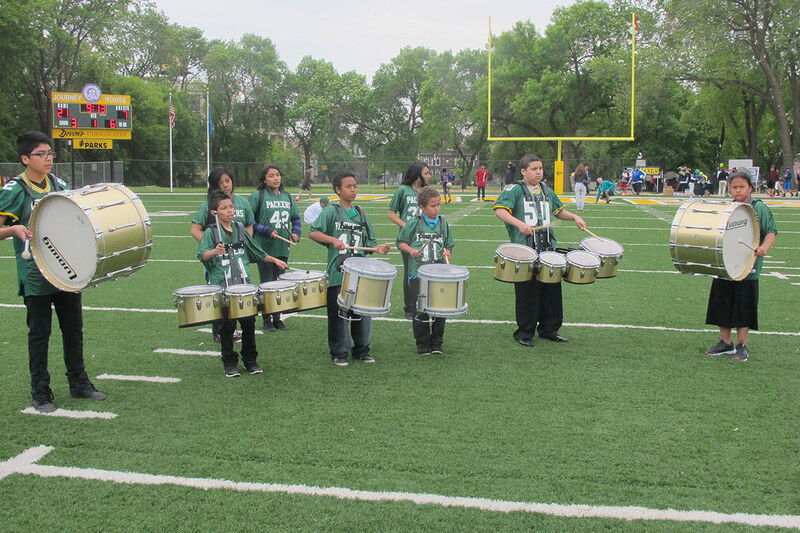 A marching band plays at the opening celebration of the Journey House Packers Field at Mitchell Park in spring 2013. Photo by Edgar Mendez/NNS. 3) Mitchell Park: Milwaukee County Parks Department received a grant from the Zilber Family Foundation to update the 2000 master plan for the park. The community participated in updating the plan, which was completed in 2010. 4) Sports-Plex: This project was envisioned for Mitchell Park. It has not been built but is still “on the table.” The 25-acre Baran Park, which is now managed by Journey House, is another potential Sports-Plex location. 5) Skateboard Park: This project, also envisioned in Mitchell Park, has not yet materialized and might be part of a future Sports-Plex. 6) Bike and Pedestrian Pathways: Although permanent pathways have not been created, bike and walking initiatives such as Ciclovia, launched in 2015, support these activities. Dream Bikes brings mobile bike repair units to neighborhood playgrounds during the summers and CSNI is working with the city to extend a bike path into Clarke Square from the east. 7) Clarke Square Park Revitalization: The playground has been updated and a plan for renovating the pavilion has been completed and funds raised. Three concerts were held in the park this summer. New housing units planned across from the north and south sides of the park are expected to increase the number of residents using it. 8) Milwaukee Christian Center: Plans to expand the center changed when the boiler failed at its main site at 2137 W. Greenfield. MCC rehabbed a building at 14th and National Avenue and moved into it in May 2013. 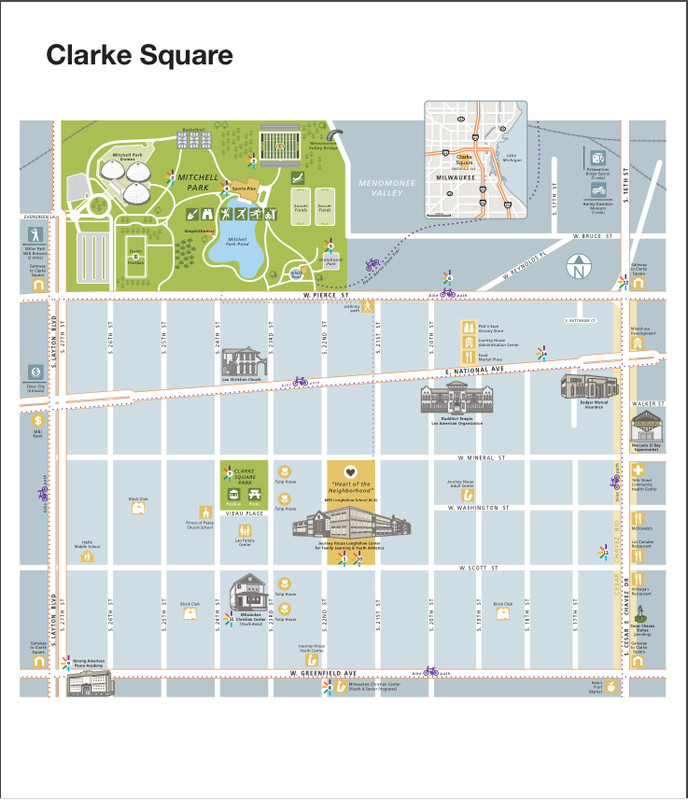 Though it is no longer located in Clarke Square, it still serves many Clarke Square residents. The center’s Affordable Housing Production and YouthBuild programs built or renovated and sold seven homes in Clarke Square during the past 10 years. 10) Urban Careers Institute: 9) Hmong American Peace Academy: The MPS charter school expanded from K6 to K12 and moved to the former Morse Middle School building on the Northwest Side in 2010. 10) Urban Careers Institute: The institute was established and then evolved into the THRIVE workforce readiness and training program for adults and teens. It offers training in construction, manufacturing, retail, hospitality, non-medical health occupations and finance. 11) New Energy Star Homes: All of the Milwaukee Christian Center homes and Journey House YouthBuild homes are built for the highest possible energy efficiency. 12) Welcome to Clarke Square: Steel markers with glass-like inserts were installed in spring 2011 at Longfellow School, Mitchell Park, the corner of the 1600 block of West National Avenue, the 1300 block of South Cesar E. Chavez Drive and the 1300 block of South Layton Boulevard. 13) Cesar Chavez Business Improvement District: One of the city’s smallest BIDs, geographically and in revenue, the 12-year-old organization worked with CSNI to double its income to $50,000 last year, including assessments, grants and other investments. The BID has revitalized its board following leadership departures, and seated six new members in 2017. 14) Cesar Chavez Drive & National Avenue: This major commercial intersection on the eastern edge of the neighborhood has been activated on all four corners, with restaurants, a bank and renovated warehouse turned into apartments.